The smash comedy hit of the London and Broadway stages, this much-revived classic from the playwright of Private Lives offers up fussy, cantankerous novelist Charles Condomine, re-married but haunted (literally) by the ghost of his late first wife, the clever and insistent Elvira who is called up by a visiting "happy medium," one Madame Arcatil. 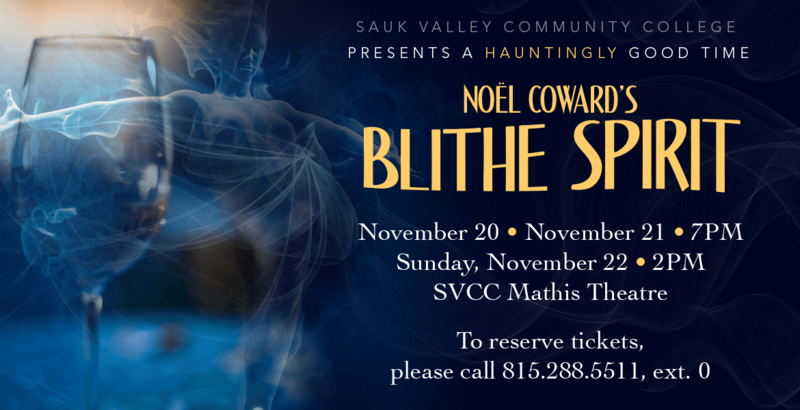 "Blithe Spirit" is Produced by Special Arrangement with Samuel French, Inc.
Tickets can be picked up and/or purchased in the East Mall beginning an hour before show time. To reserve tickets, please call 815-288-5511, extension 0.